The Dormie is one of our best selling slippers! 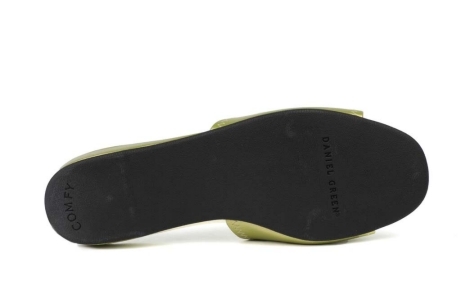 If you are buying the Daniel Green Dormie for the first time, we suggest buying your normal shoe size. Comments: I won't wear anything else. "Why discontinue such a great 5-star model???" Comments: Why discontinue such a great 5-star model??? Comments: I love these Dormie's. I have bought at least 6 pairs in the past year. I have a narrow width,, and these are very comfortable. They are so comfortable I forget that I have them on when I go outside. So I have a few that I wear outside only. Love, love these slippers!!! Comments: My mom is letting me borrow her Dormies because of my pregnancy-related feet and ankle swelling. They are a lifesaver and I will be buying my own pair. Comments: I am 74 years young and I have been buying Dormies sense I was in my teens. The Black , Gold, Pewder, and Bone are my favorites. I see you have some new ones I may try. All I can say is Please don't stop making them. "3rd Generation Daniel Green Dormie Slipper Wearer"
Comments: The very first thing I do when I come home is reach for my Daniel Greens! I regularly buy the bone and black and look forward to purchasing some of the newer colors. I have purchased the gold and they're wonderful looking, but the finish cracked early on. I'm giving them a second try though and hope they hold up a little better this time. Comments: I'm very satisfied with my slippers. I had a pair that I got all of my money's worth. When I went to my local retailer to purchase another pair only to find that they no longer sold them. Did find them on the internet, ordered and am very satisfied. Comments: Very stylist slippers!!! My wife loves wearing them, wish she can use them at the office! !